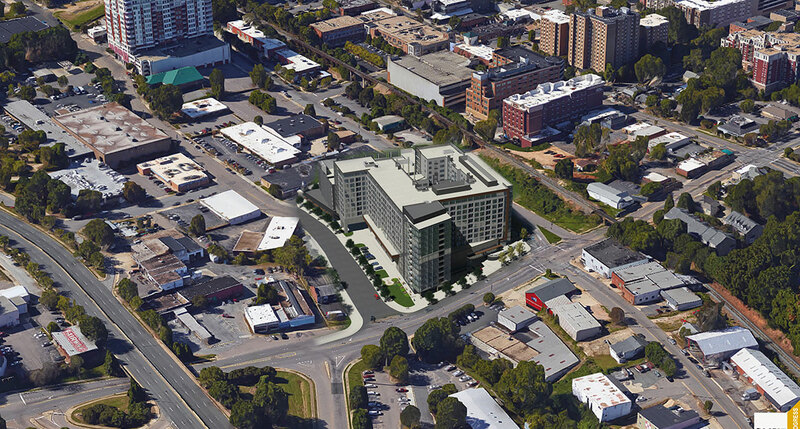 RALEIGH – Kane Realty and Williams Realty & Building Co. announced Friday plans to build an $85 million to $100 million project at the northern edge of downtown Raleigh that will include 400 apartments and ground floor retail. The project promises to transform this section of downtown, which has drawn increased interest from developers in recent years. In February, Kane Realty and Williams Realty paid $4.6 million to acquire a 1.24-acre site that is now home to ThemeWorks and the Southland Ballroom music venue. Raleigh-based Williams Realty, through two separate entities – Chaucer Investments and The Crossland Company – already own four other nearby parcels totaling 2.44 acres. John Kane, Kane Realty’s CEO, said the project will occupy nearly all of that land and will include between 40,000 to 50,000 square feet of retail. The site has been linked to Publix, one of several grocery chains that are reportedly considering opening a store downtown. But Kane said his group has reached no agreements with anchor tenants. He said the hope is to have multiple shops and restaurants fill up the retail space. “We’d love to have multiple retail there, which helps create more of an atmosphere,” he said. The project will include a parking deck, an interior courtyard and an elevated terrace overlooking downtown for renters. Kane said the timing of the project will tie in with planned road improvements in the area. This summer the state Department of Transportation will break ground on replacing the Capital Boulevard bridge over Peace Street and reconfiguring the street grid. The project will also reconstruct the Wade Avenue bridge and add a new landscaped median along Capital. The project, which is expected to take three years, will eliminate the ramps on the northwest side of the Capital/Peace interchange to make room for Devereaux Meadows, a new park that the city plans to build at the corner of Peace and Capital. Under the new configuration, drivers entering downtown will exit Capital after the bridge by taking a right onto Johnson Street. Kane Realty and Williams Realty will need site plan approval from the city before moving ahead with their project. John Kane said his group hopes to begin construction in the first quarter of next year, with the project expected to take 24 to 26 months to complete. “This will be a long project to be built because it’s complicated,” he said. With this latest venture, Kane is further extending his development canvas beyond North Hills, where he first made his name and which continues to expand on the eastern side of Six Forks Road. Kane has more recently developed a student housing complex, The Stanhope, on Hillsborough Street and construction is now underway on The Dillon, a $150 million project in downtown’s Warehouse District. The Dillon will include a 17-story office tower directly across West Martin Street from CAM Raleigh; a 1,000-space parking deck and two six-story apartment buildings on the north and south sides of West Hargett Street.